Japanese grammar has a few quirks, and I would say that after sentence structure, the use of particles is the trickiest thing for Japanese beginners to get their head around. Particles are little words similar to prepositions in English that follow verbs, nouns and adjectives to indicate various things within a sentence. I like to think of them as little signposts that show the relationship between different parts within the sentence. Let’s have a look at an example sentence. In the example above, は indicates the topic and に indicates the destination. 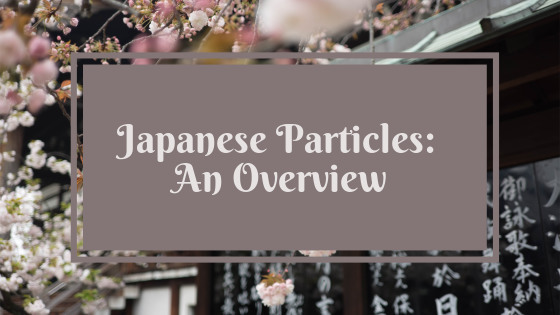 If you are looking to get a book that has a great job of explaining the vast majority of the particles you are likely to come across, then I would consider the book All About Particles by Naoko Chino. This book gives an overview of what each particle can mean in different contexts alongside example sentences. I like that the book shows where particles can be used interchangeably as well as how this can affect the nuance of the sentence, especially with the infamous ha and ga particles. This makes it a great reference book for beginner-intermediate learners. Getting a good grasp on how particles work from an early stage will help immensely later on when tackling more complex grammar, so do not be afraid to spend a lot of time on studying particles. The JLPT grammar section has some questions on particles where you have to select the appropriate particle missing from the sentence. This is a great way to practice as there are a few quizzes available online. Pay attention to the sentences you use in your normal studies. I do write a lot about the importance of context – when it comes to particles, certain verbs for example will be used with specific particles, eg. 〜が見えます instead of 〜を見えます. Check out online worksheets that ask you to fill in missing particles – MLC Japanese have a couple of PDF worksheets for basic particles (Level 1) and more complex usage (Level 2). How do you study particles? Know any useful resources? Let me know in the comments! Particles are one of the first things we study, but truly mastering them looks like an endless road to me. Even my JLPT book for N2 has a whole lesson devoted to the difference between は and が and I always find the JLPT questions on particles to be the most tricky!